Your pet can now become a #1 fan with this officially licensed MLB PET COLLAR. Looking for a STRONG and DURABLE DOG COLLAR?? Oh, you also want it to be COOL and Fashionable? 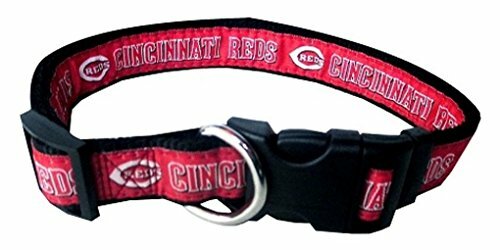 You can now buy your sporty pup the collar of your favorite MLB team!!! This MLB DOG COLLAR will bring fun and excitement to you as well as to your four legged sports fan!!! Get ready for some BASEBALL with a COOL COLLAR that includes your favorite TEAM NAME and LOGO so that you can stand out in the crowd! This MLB COLLAR is made with Heavy-Duty nylon material to ensure durability! It features your favorite Baseball Team NAME and LOGO in vibrant team color! It has a metal D ring to attach your leash! Designed with breakaway buckle for easy open/close! Hit a HOMERUN with this authentic PET COLLAR so your entire family is ready for game day! This NEW SPORTS COLLAR is adjustable for a perfect and comfortable fit! NEW: Size X-Large has an Anti-open safety feature for extra safety! ○ Please follow the illustrated Size Chart located in image #2 and match your pet’s neck to the correct size! Choose your team and correct size, and Add to Cart Now!